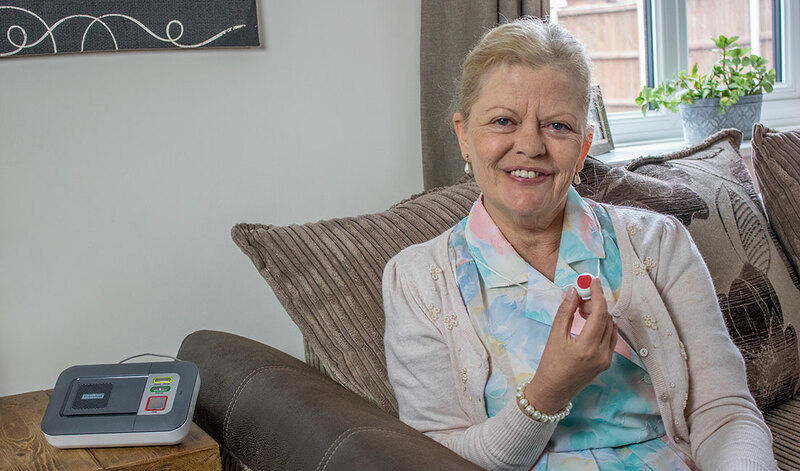 Careline alarms can often have a stigma surrounding them. Some users are put off at the thought of wearing a red button around their neck, whilst others prefer this option. Additionally, a lot of people think the alarm pendant will be big and bulky, very obvious and will weigh the alarm user down. However, this is not the case with our Careline Alarm, as explained in this article. How do I Wear my Alarm Pendant? The word ‘pendant’ derives from the Latin word pendere and the Old French word pendr. Both of these words translate to “to hang down”. Despite this, our alarm pendant does not have to be worn hanging around the neck. The MyAmie red button has been developed following customer feedback. This feedback showed an increased number of people preferred to wear the pendant on their wrist. With every order, we provide different attachments which allows the user to make their own decision. As mentioned above, this is usually the wearing option people associate with a personal alarm and is still a very popular choice. The white neck cord is included with each alarm and has a safety break link. If the alarm user is worried that they may not be able to access their pendant under their jumper, they can always wear on top, as pictured below. Alternatively, if the alarm user doesn’t like the neck cord, we provide the wrist strap with every order. This is a soft hypoallergenic, elasticated strap with clasp and the alarm user can choose between two widths. This is a very popular wearing choice as many feel it can be disguised as a watch, leaving the alarm user feeling less vulnerable. 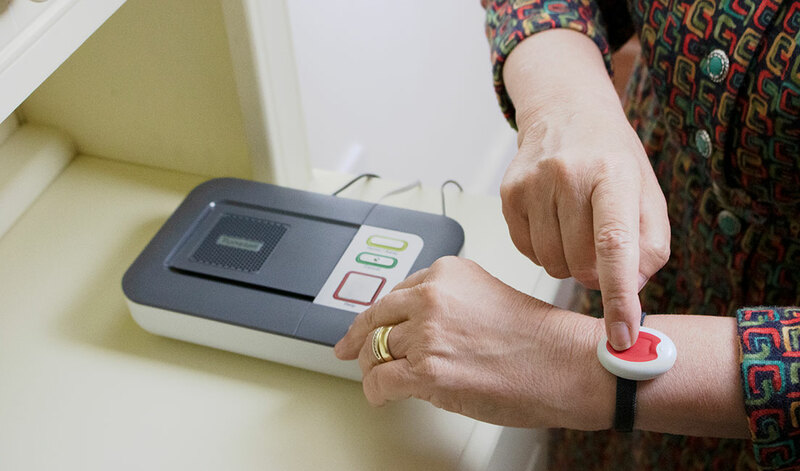 Wearing the alarm button around the wrist also helps to make the alarm easily accessible. Your loved one will not have to worry about pulling the alarm out from under their clothing. The neck cord and wrist strap are provided as standard. However, if necessary, we do have other options available. Belt Clip – This allows the alarm user to attach the alarm button to their clothing. Additionally, it can be used to wall mount the pendant. Easy Press Adaptor – Not necessarily a wearing option, but this can make the alarm easier to use for anyone who suffers from limited dexterity. The alarm pendant has been designed with the alarm user in mind. It’s small and discreet whilst remaining comfortable, being half the size of its predecessor. Whilst the pendant is smaller, the size of the actual red button is a third larger, making it easier to press when needed. As a result, your loved one will be more likely to wear the pendant. If you would like to order a Careline alarm, you can do so on our website. Alternatively, our Customer Service Team are available on 0800 101 3333 to answer any questions, and help with the order.